So.B.It. is a very nice book about people who have to deal with disabilities. Sarah Weeks has shown how not all kids are as fortunate as us. This story is about Heidi and her mother who has disabilities. We don’t choose our parents. Our parents love us for who we are, but for kids, it’s a little harder to accept if we have not so perfect parents. So.B.It is Heidi’s mother who has brain disabilities. One time she was in a city and almost got hit by a car. So.B.It. was found crying, carrying her infant, on a stranger’s. This person, Bernadette, took them in and nursed Heidi and her mother. Bernadette then got Heidi an apartment next to theirs with a connected door because Bernadette herself had a fear of going outside. So.B.It. had a very limited vocabulary because of her disability. Her one mysterious word was soof. Nobody knew what soof meant, and Heidi wanted to know. 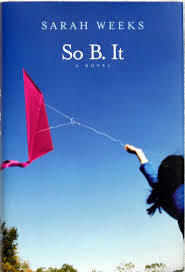 This book is about Heidi wanting to learn what “soof” means and her journey to make that discovery. Amazing and touching book. A must read.